Here is a link to the article. But don't click the link, save one of your ten free monthly online articles to read about stabbings at Family Dollars on Getwell. Go and buy the paper. See the cool images. 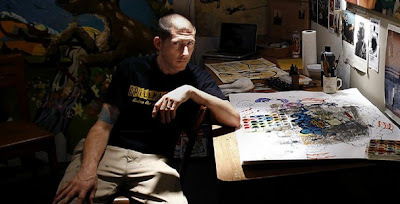 Do, however, click on the links to his website, see how great the work is, perfect for my tattoo. A steamboat on the Mississippi filled with cotton and barrels of whiskey. At least, that is what I want. This is a pretty good article about Spillman from Fredric, that point being do what you want to do, not what you think you should do. This pic of Bobby is hot. Like at art star and stuff. But, I do feel like he should be holding a cigar.